I have hit the crochet professional big time! 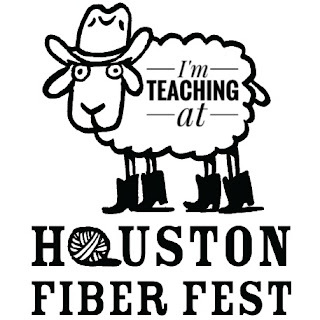 My proposal to teach a class at the fabulous Houston Fiber Fest was accepted. Yay! I have been teaching for around three years now, the last two and half at my local yarn store, so I thought it was time for a little challenge. Last year I attended the Houston Fiber Fest for the first time. In fact, it was my first time ever visiting any fiber fest. Places are spread out in the US and with young children there isn't a lot of gallivanting around for me. Anyway, even though it was my first fiber fest ever I did manage to record an audio review of the event and it features on episode six of the superb Crochet Circle podcast around 40 odd minutes in. The event takes place June 23-25 at the Berry Centre in Cypress, TX. It is truly yarntastic and well worth attending even if you're not one of the special twelve attendees who gets to hook socks with me! Check out the Fiber Fest website, Ravery group and Facebook group. Shall I meet you there? I daresay you may see crochet socks popping up on my Instagram and Twitter accounts in the near future. I'm @craftyescapism if you hadn't guessed! Have a fantastic week y'all! This is so exciting! I'm really happy for you, what a terrific opportunity. I'll be sure to follow you on Instagram! Thank you Nicole. You are so sweet! I'll look out for you on Instagram!! Ooh! I have bookmarked that review to listen to later in the week (it is very late as I type this and really past my bedtime!) and I will revisit your sock topics. It will soon be cooler weather and the feet will be wanting warmer socks to wear to the footy. Good luck at the Fiber Fest. May you have good students and a happy time. I'm sure you'll enjoy the Crochet Circle podcast Jodie. Yes that is what my voice actually sounds like!! I have to remind myself that your weather is getting cooler as ours gets warmer. I've just started writing a simple sock pattern for my sock class today. Lots of prep ahead but it's all fun!